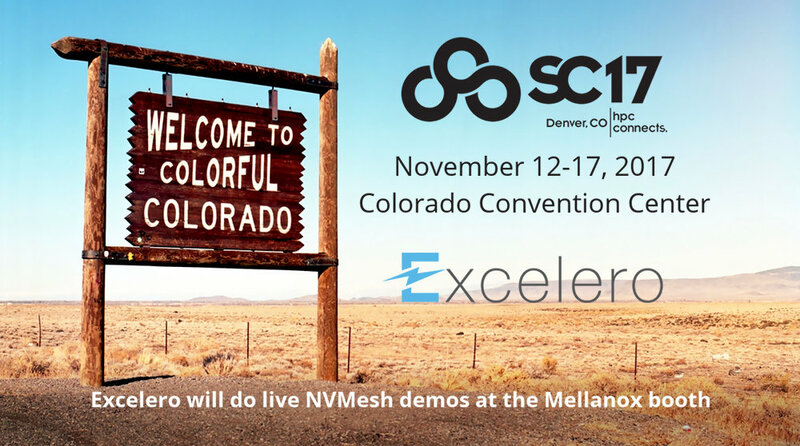 As the Excelero team is packing to fly out to Denver for SuperComputing 2017 (SC17), I thought it would be a good idea to provide an overview of all the exciting stuff we’ll have going on at the event. We chose to leverage our strong partner ecosystem for this event. As a result, you will find Excelero all over SC17, in over half a dozen of booths, with an impressive range of use cases, including the SolidScale RA with Supermicro, a live high-performance GPFS demo at the Mellanox booth, the Talyn server at Boston Limited and much more with Lenovo, ArcaStream, Echostream and Intel. Cherry to the cake is the announcement of SciNet as a new Supercomputing customer. Live Demo with Mellanox – booth # 653 – where Excelero is demonstrating its NVMesh’s IBM Spectrum Scale integration for HPC applications and use cases, using the SuperMicro BigTwin and Mellanox’s ConnectX as a pivotal underlying technology. Backed by Mellanox’s end-to-end 100GBs Infiniband and Ethernet solutions, Excelero customers can deploy high-performance NVMe SSDs as a unified and converged, data center-scale storage and compute infrastructure to run high-performance workloads such as burst buffer cache and other HPC workloads in converged environments. Excelero will be showcasing a live demonstration of a converged IBM Spectrum Scale cluster with burst buffer. The 2U system provides 40GBs parallel and concurrent filesystem write performance. Supermicro – booth # 1611 and Micron – booth #1963 – who together are bringing Excelero’s acclaimed technology advantages that were incorporated in the SolidScale reference architecture, which Micron now markets as Micron Accelerated Solutions (MAS) and SuperMicro sells via the extensive Supermicro global channels. Boston Limited – booth #1775 – displaying the Boston Limited Flash-IO Talyn, with key Mellanox, Micron and Supermicro technologies. The solution solves one of the biggest challenges in computing today – shared access to NVMe flash storage volumes at the low latency and high-performance required by GPU-based applications, yet with minimum processor overhead. Employing Excelero’s server SAN along with other leading technologies such as RoCE v2 and 100Gbit/s EDR InfiniBand with 100GbE from Mellanox’ Connect-X 5 range, processor overhead and latency is kept low, while bandwidth is plentiful. ArcaStream – participating in the WD booth #643 – ArcaStream delivers software defined scale-out storage and data management solutions designed to meet the specific needs of research and simulation users worldwide. Specialized in high-performance storage and IBM Spectrum Scale solutions, Arcastream is a leading integration partner for Excelero’s Burst Buffer use case. Lenovo – booth #1353 – Lenovo and Excelero have joined forces to deliver a high-performance, low-latency Server SAN solutions leveraging Lenovo servers with NVMe flash, high-performance networking and Excelero NVMesh. Marrying high-performance, reliable, standard servers from Lenovo with innovative and revolutionary software from Excelero enables what was previously unattainable: the cost savings of standard servers, the performance of local flash with the convenience and protection of centrally managed storage. The Lenovo and Excelero teams will also celebrate the SciNet win. Echostream, Premio and Intel – booth # 1319 – Premio will showcase a high-performance software-defined-storage (SDS) solution at Intel’s “Channel Pavilion Area” booth. The demo will feature up to 400 Gb/s constant throughput and up to “8 Million” IOPS and features Premio’s patented 2U, 24 bay NVMe U.2 flash storage server (FlacheStreams). Alongside the hardware innovations from Premio, Intel, and Mellanox the solution features Excelero’s NVMesh software, enabling a virtual SAN approach for shared NVMe.